Editor’s Note: This article is part two of Thrillist Portland’s year-end look at the best of our city’s local food and drink scene in 2016. In addition to our annual Best New Restaurants award, this year, we’re spotlighting the men and women behind the dishes we love to tell you to eat. Whether they bucked the national trends, revived classic local flavors, or otherwise drove the city's culinary scene, these are the chefs that stood out this year. You can also check out our picks for the rest of America’s 2016 Best Chefs, and then catch up on our Best New Restaurants. Hailed as a brunch-crazed mecca of the culinary world, the city of Portland has seen its fair share of truly exceptional chefs over the past few years. It’s a city that prides itself on innovation, on who can come up with the most Portlandia-esque level of absurdity complete with plenty of craft beer in tow -- and never fails to deliver in its delights. We’ve taken a long look at Portland’s latest and greatest to not only arrive at Thrillist PDX's five Best Chefs of 2016 but to also bring you the stories of the greats: the trials, tribulations, and secrets behind the kind of chocolate chip cookies that take three days to make. So sit back and enjoy the ride, because things are about to get real hungry up in here. 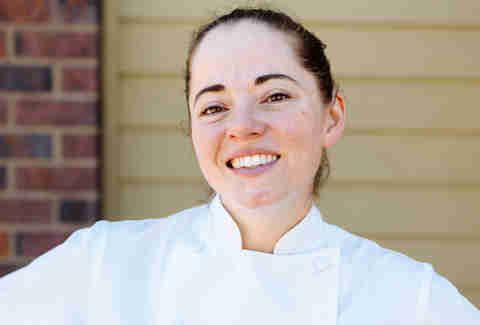 After stints working at Beast and Bollywood Kitchen, Lovelace’s fondness for family dinners would eventually lead to the creation of the pop-up Mae, where the goal is to “make people feel like they've experienced a warm hug.” Mae’s specialty lies in whipping up Appalachian cooking, a regional style of Southern cuisine based in intense seasonality, preservation, and foraging. “It's a very exciting way to cook, and it helps me feel connected to my family and my ancestors,” she says. You can see Lovelace making the rounds at dinner, personally greeting her diners and delivering every plate of food to the table. Served family style, the 10-course dinner features some of the best fried chicken and pickles you’ll ever have (and will probably come back for again and again). 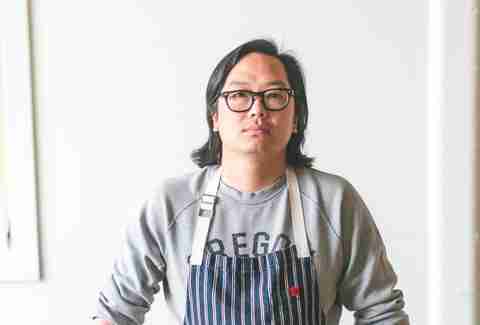 From chowing down in Brooklyn’s Koreatown to serving up Korean-style BBQ to Portlanders on the daily, Peter Cho’s love of Korean food knows no bounds. 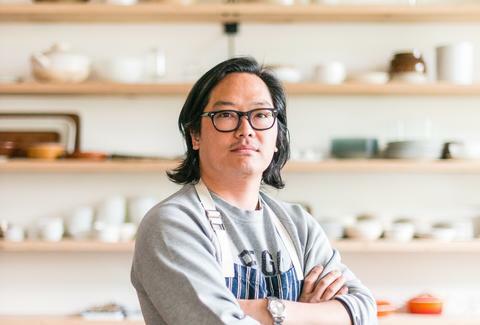 Cho started out as the right hand man to April Bloomfield, co-owner of New York’s infamous Michelin-starred restaurant The Spotted Pig, before taking his talents to the West Coast to spread the good word about Korean eats. After a few years of wowing diners with elevated hot dogs and Korean fried chicken on steroids during his pop-ups, Stray Dogs and Stray Birds, his new brick & mortar project, Han Oak, is a little more grounded in its aim. Tucked into the lot behind 24th and Meatballs, Han Oak (a term used to describe traditional Korean homes) is an innocuous looking prix-fixe reservations-only joint out on a mission. While Han Oak’s exudes an inviting, homey feel, the food is a far cry from your mom’s meatloaf, with Korean classics meeting Pacific NW flair birthing dishes like a blood cake and duck fat fried egg, and spicy fried Korean cauliflower made with gochujang and tamarind. “The food is my interpretation of classic korean dishes… with lots of funk and acid -- not crazy spicy, but balanced.” Chow down on a Korean brunch on Sunday funday from 11am to 3pm, or if you’re in the mood for some of that balanced funk, make yourself a reservation and hunker down for dinner on Friday or Saturday night between 6 and 11pm. Your belly will thank you. When the going gets tough, the tough get cooking. Case in point: Coquine’s Katy Millard, whose backstory reads like a fantastical film synopsis. After having most of her possessions destroyed in a fire on April Fool’s Day in college, she decided that with nothing left to lose, she would backpack around Europe. Given her background studying hospitality, most people would settle for just about any hotel or kitchen job… but not Katy. She marched into the Michelin-starred restaurant Guy Savoy in Paris, asked for a job, and the rest is sweet, sweet history. 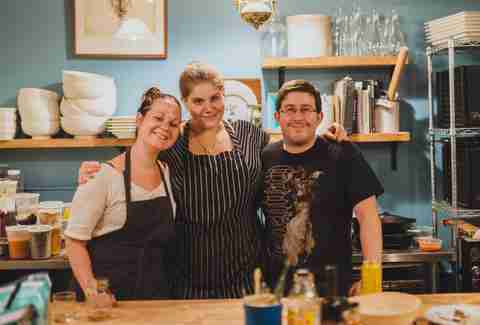 Coquine is a cozy spot that serves up thoughtful dinners laced with Pacific Northwest flair inspired by Katy’s commitment to detail. “I spent years cooking in Portland, developing relationships with farmers, foragers, purveyors… to make every visit better than the last.” The roast chicken is widely hailed as some of the best you’ll get your hands on in town; and the legendary chocolate chip cookies (which were far and away the hit of this year's Feast) take three whole days to make. Born in Connecticut, Tommy “Puff Daddy” Habetz started under the tutelage of Iron Chef Bobby Flay at the legendary Mesa Grill in Las Vegas before working his way to Sous Chef at Mario Batali’s Roman trattoria Lupa. Though he’s seen his fair share of the high end restaurant life, Habetz made the move to Portland in 2002, finding that he had fallen “in love pretty quickly with the city of Gus Van Sant and Callahan and Coffee People.” Bunk Sandwiches opened to loud applause in 2008 as the culinary world swooned over his pork belly cubano sandwiches, a roar which has only grown louder with the success of his new restaurant, Pizza Jerk. Inspired by a childhood love affair with pizza on the East coast, Habetz set out to “create the pizza place that we [partners Brandon Smyth and Ben Hufford] wanted to hang out in as kids.” It’s no ordinary pizza joint, either: you’ll not only find old timey vintage arcade games here, but a garden devoted to cultivating the produce right outside in the parking lot. “We wanted to start a community garden, more of a gathering place than a high volume garden,” a feat which reflects Habetz’s passion for the kind of community that makes Pizza Jerk so friendly. You can find eclectic food mashups here, like pizzas covered in brisket, or the famous Dan Dan noodles pizza draped in noodles, pork, and chili oil. Despite suffering a fire over the summer, Bon Appetit still dubbed Pizza Jerk one of the “3 Best New Pizza Joints in America.” Thanks to the support from the local community, it reopened only a few months after the fire, proving that “there's a lot of love for The Jerk” after all. Brandon Weeks makes the kind of food that brings all the Portlanders to the yard, serving up “gnarly American brunch” delicacies like red velvet waffles and crispy pork ribs with cheesy grits together in perfect harmony. It’s a sweet-savory combination that makes the milkshake and french fries combo look almost amateur that’s born from a love of pastry going way, way back -- though not exactly to the kind of start you’d imagine. Born in the Salt Lake 'hood with a curious heart, Weeks moved to Portland at 21 after having spent a few nights “camping under a random complex for a night” and worked just about every odd job out there (including stints as a performing juggler and pest control technician). After spending some time running a chicken farm, one of those late night Le Cordeon Bleu commercials -- and a good dose of “pure youthful ignorance” -- finally got to Weeks in the end, giving him the kick he needed to go to culinary school. The best part? For a mere $20 on Saturdays and Sundays, you can nab both a sweet and savory brunch item, along with a drink. There’s Nintendo to be played, coloring sheets to be filled, and for a brief time, a weed-infused pop-up brunch which stole the hearts of Portlanders and earned the ire of worried neighbors alike. For those that can’t get enough of Weeks’ playful culinary style, there’s plenty of hope for the future: “I'm toying around with the idea of a counter service joint. Working name: Brunchitos, selling a small menu of breakfast burritos, coffee, juice, mimosas, and a few sweets like churros and ice cream-stuffed cake donuts, lovingly called ‘glory holes.’” We’re guessing there’s more to a name than Shakespeare let on.